We have heard a lot about dog grooming and its importance in maintaining the dog’s well-being. Grooming is a way for us, as dog owners, to not only maintain our dog’s nice and clean appearance but also give him an overall health check up for any abnormality. So how about cat? We usually see that cats tend to clean themselves by licking, and they very much dislike being groomed or touched. But the question is that whether grooming is also beneficial for them as it is for dogs? Are there any differences in cat grooming compared to dog grooming? Will dog clippers and grooming tools also work on cats? Those are the questions that are frequently asked by pet owners. Of course there are tons of information regarding pets that owners need to know, but let’s start with the basics first. Do cats need grooming at all? The short answer is YES. While many people think that cats need less maintenance and care as they are capable of cleaning themselves, the truth is cats do need our care and cleaning. Similar to dogs, grooming is enormously beneficial to cats for the similar reasons. Grooming acts as an overall health check-up to detect unusual lumps, red spots, wounds, etc. so that we can promptly bring them to vets. These symptoms are the hints for cat owners to detect any diseases at the earlier stage so that their cats can be cured before the disease or illness gets worse. So how do you groom your cat? Grooming a cat is not limited to just brushing and trimming. There are plenty of tasks you should do, from checking the skin, coat, and entire body to checking even her breaths. Cat grooming is almost similar to dog grooming. First, you can start with checking the ears. See if there is any abnormal bleeding, excessive wax, or dirt build-up in the ears. Sometimes when your cat plays on the ground and her ears are quite dirty, this is completely normal. However, if there is any unpleasant smell or odor, some infections may be going on, and that you need to consult a vet immediately. Next, you can check the eyes and nose. Your cat’s eyes should be bright and clear. If you notice any redness, high chance is that there is infection. Again, anytime you spot an clue for infection, bring your cat to the vet promptly for medical advices. For the nose, you can gently touch her nose to check for lumps, or bumps. Most of the time, cats’ noses are moist and smooth, so by just a gentle touch, you can definitely tell if there is any suspicious sign of infection. Coat and skin obviously need checking. As a cat owner, you may notice that your cat does lick herself a lot. This is how a cat cleans her body, unlike dogs that need regular bathing. However, excessive licking and scratching can be a big problem. 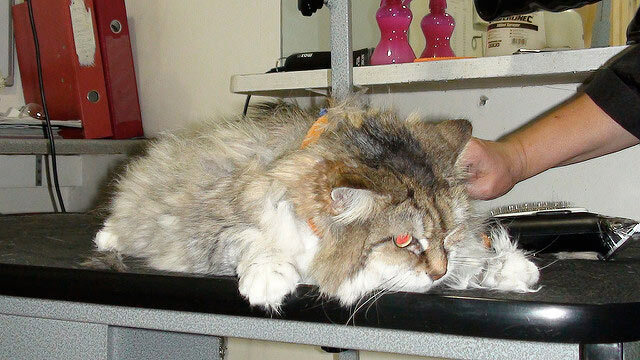 If you see your cat constantly lick and scratch her body, do not hesitate to bring her to a vet. Last but not least, check her breathing. A healthy cat should be able to breath effortlessly. Once she seems to be short of breath, be alert because this is abnormal to cats. Ideally, you would want to check all the body parts of your cats. The body parts discussed above are common areas that you should check more regularly as any unusual signs can tell you a lot about your cat’s health status. Do dog clipper and grooming tools work on cats? We have seen this questions asked by a vast number of pet owners. And this is a really interesting question. To some people, we are identified with either a dog person or a cat person, but in reality, lots of people are mixed. Why should there be any problem on having both cats and dogs? In fact, dogs and cats do get along with each other pretty well. So if you already have a dog, you probably know a lot about dog grooming and possess some certain DIY dog clippers or grooming tools at home. And now you have a cat, and you wonder if you can use same tools on your cats to save some money from purchasing completely new ones. This concern is totally understandable. To answer that, we need to know if the structure of a cat’s coat differs from that of a dog. Generally, cats’ fur are shorter and thinner. Although there are long-haired cats that need regular brushing, other breeds have shorter hair compared to dogs. Dog clippers are designed to have strong power to cut through thick layers of fur without damaging the tool and generating too much heat. Hence, such powerful clipper does not ideally work on cats. Instead, if you have a clipper kit that comes with various blades, maybe there are few thinner blades that can actually work on your cat. Another type of clipper that we can do comparison is nail clipper. Cat nails are more delicate compared to dog nails. There are various types of nail clippers available in the market, and it is suggested that you get a cat nail clipper for cats. A fun fact is that human nail clippers do work on cats too. Human fingernail clippers are told to be easily used on cats, so if you want to save some bucks, this can be a nice solution. In short, although the needs for grooming for both cats and dogs are somewhat similar, their bodies are not. Even though it totally makes sense that it is more cost-efficient to use same tools for both cats and dogs, doing so is not recommended. Doing so may cause harms to your cats that you are unaware of. However, as there are many options in the market, we strongly believe that you can definitely get a right tool for your cat at an affordable range.